It seems I’m always promoting Durham in these pages, and this post will be no exception. Toast is to Durham as Neal’s Deli is to Carrboro – a great little sandwich counter. Raleigh’s lack of such an establishment remains a mystery, and reason enough to search the wider Triangle, as above, for a better sandwich experience. Toast is an Italian style café serving panini, salads, and soups. The restaurant occupies a narrow space in the city’s downtown, with small tables inside plus a few more spilling out onto the sidewalk in front. It’s coffee-shop casual, and, if necessary, you can be in and out very quickly, but it’s charming enough to make it a nice spot to linger and chat. Just order at the counter and help yourself to a drink. The menu features plenty of classic Italian flavors. It also does not appear to have changed much, if any, in the few years since the restaurant opened. 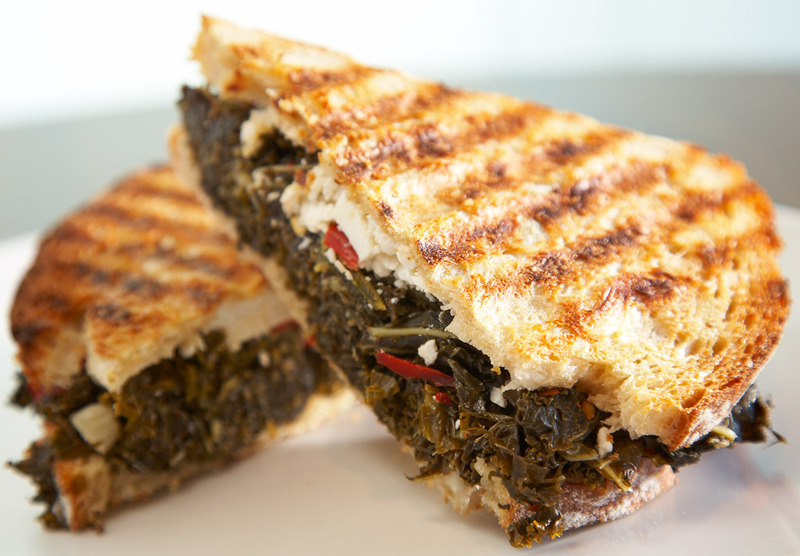 I selected the rapini/sweet Italian sausage/roasted garlic/asiago fresca panino ($6.50) and a cup of the daily soup – spicy lentil with peppers ($2). My wife chose three crostini + salad ($8.75). For this price you get two of each of the crostini, which are cut from a baguette into thin slices, toasted, and piled with the toppings. Her choices were warm goat cheese/local honey/cracked black pepper, pesto/mozzarella/roasted tomato, and garlicky mushrooms/thyme/gorgonzola. Our food came out promptly. To sum it up: it was a little disappointing. Perhaps my expectations were too high; we’d had great food here before. This time, though, my sandwich was not terribly flavorful. I couldn’t make out the roasted garlic, the sausage was too mild, and, if such a thing can be said, there was too much cheese. The bread was nicely crisp and buttery though, and the soup was rich, hearty, and satisfying. My wife’s crostini had sort of the opposite problem: the flavors were too strong, and there was too much salt. The clear winner for her was the creamy goat cheese one. She did report her salad to be deliciously bright, herby, and fresh. So while we weren’t wowed by Toast this time around, we’ll be back for more. And here’s hoping for a sandwich spot like this in Raleigh. For it’s places like these that help make Durham a vibrant community, and that’s why I’ll continue to visit – and celebrate – the Bull City.